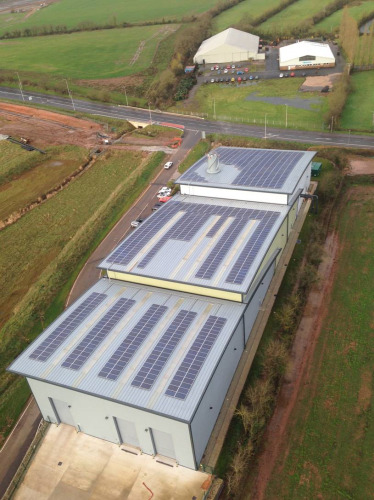 The Cranbrook energy centre is already fitted with rooftop solar panels and the project will seek to incorporate the electricity generated by those panels and use it to power the heat pump, providing another low or zero carbon energy source to replace mains power. SunPower Corp will build a 3.4 MW ground-mounted solar power plant in the Lazio region of Italy for E.ON Climate and Renewables Italia Solar Srl. Abengoa Solar and E.ON Climate & Renewables will jointly own and operate two 50 MW concentrating solar power (CSP) plants in Spain. A low carbon heating project led by E.ON working with the University of Exeter and technology providers SK Solar and Star Renewable Energy has been awarded a Government research grant to carry out the feasibility work to create a UK-first community-wide energy scheme based on emissions-free renewable energy sources. The combined heat and power project, to be funded by the Department of Energy and Climate Change (DECC), is based at E.ON’s energy centre in Cranbrook to the east of Exeter will seek to demonstrate how solar thermal panels and heat pumps can replace or work alongside the existing gas-fired district heating scheme to provide a lower cost and significantly lower carbon heating and hot water source. “We’re delighted this innovative research has got the go ahead and are looking forward to working with partners in the project which builds of the Centre of Energy and Environment’s long-term links with district heating at Cranbrook and our renewable energy expertise in Cornwall," said professor Chris Smith, University of Exeter’s Engineering Director of Research. How it works: The existing district heating scheme provides a central source of heat and hot water from the energy centre, which is then supplied to homes in Cranbrook and the nearby Skypark commercial complex through a network of super-insulated underground pipes. It will supply the 3,500 new homes in Cranbrook as well as 1.4 million sq ft of industrial space at Skypark. The project will see the installation of approximately 2,000 sq m solar thermal array on land next to the energy centre as well as a high-temperature (>80°C) heat pump. Furthermore, the ground-mounted panels will collect solar heat to supply the heat pump which will increase the water temperature ready for use in the heating system. Hot water not needed immediately can be stored in a dedicated thermal storage tank which will be installed alongside existing equipment attached to the district heating system. “District heating schemes such as Cranbrook are lower carbon by their very design, and we often see carbon savings of around a quarter compared to traditional home heating such as gas boilers," Jeremy Bungey, Head of Community Energy at E.ON, explained. “By migrating the energy source from gas-fired combined heat and power plants to renewable energy sources we believe we could see a further significant reduction in carbon emissions and still maintain secure and reliable supplies to our customers." Some infrastructure for the combined heat and power demonstration project is already in place, as the Cranbrook energy centre is already fitted with rooftop solar panels. The project will seek to incorporate the electricity generated by those panels and use it to power the heat pump, which will provide another low or zero carbon energy source to replace mains power. Phase one of the combined heat and power project will create a detailed design of the integrated system and an assessment of possible energy performance, carbon savings and cost efficiency. If successful, the second phase will entail the installation and integration of all the technologies ahead of a full 12-month trial to test the system across different seasons and weather patterns. As E.ON's Bungey explained: “This is a demonstration project at this stage, but if it proves successful, the integrated technology we are pioneering here could be replicated in existing and new district heating schemes right across the country and would make a significant contribution to easing the impact on the environment which comes from domestic heating."